March 17th is Saint Patrick’s Day! For most of us, it’s a day to put on our green attire, grab our lucky shamrocks, and have fun with friends. Humans aren’t the only ones going green for the holiday, though. Some of our kitties are getting into the St. Paddy’s spirit, too! However, before you put your kitty in a leprechaun costume, remember to dress your pets responsibly! Not all kitties like to wear clothing and costumes. If your cat doesn’t enjoy it, don’t do it! But lots of cats don’t mind putting on a hat or a tie, and if you’re a lucky owner of one of these cats, celebrate like the kitties below! 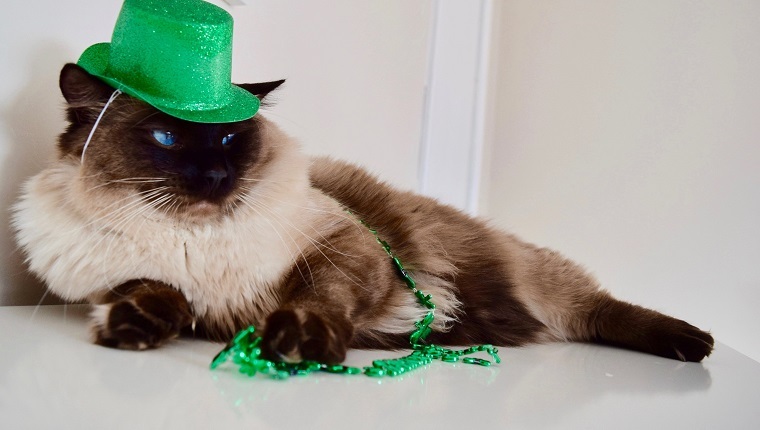 Here are 30 cats who have the luck of the Irish on Saint Patrick’s Day! 7. How Did I Let Myself Get Talked Into This Again? 8. Thanks For Including Me In Your Holidays! 14. Happy St. Cattrick’s Day! 16. What Day Is It Again? 17. Why Am I Wearing This? 18. Can I Take This Off Yet? 20. Do You Like My Bow Tie? 24. Happy St. Paddy’s Day! 25. Can I Go Back To Sleep? 26. Have A Green Day! 27. What Am I Looking For Again? 28. You Are Lucky, Cause You Get Me! 29. Kiss Me, I’m Irish! 30. Where Does This Go Again? Have a very happy Saint Patrick’s Day! What does your cat think of this holiday? Do they think it’s silly? Are they gonna pass on the St. Paddy’s Day gear? If your cat likes to dress up, please share pics in the comments below!